I donated in support of this campaign on University at Buffalo Police Department's page. I donated in support of this campaign on Jim Lenker's page. "Thank you for rockin those red pumps for a very worthy cause!" "You rocked those red shoes!" I donated in support of this campaign on Don Ko's page. "So glad you continue to support this cause. Love seeing you in the shoes each year! :) "
I donated in support of this campaign on Robyn Wiktorski-Reynolds's page. "JUST TO EVEN IT OFF! YOU'RE TERRIFIC, LARRY!" "Proud Board Member!!! Crisis Services Rocks!" I donated in support of this campaign on Loreto Dispenza's page. I donated in support of this campaign on Nicholas Tiedemann's page. "What a terrific cause! So happy to support you, Jim! Go rock those heels!!" I donated in support of this campaign on Eileen Griffin's page. "Campus Living Residential Life supports the work of Crisis Services"
"In honor of our dear friend. Your strength knows no bounds." I donated in support of this campaign on Carolyn Huffman's page. "You rock those heels Larry! " "Donation received on behalf of Bill and Bonnie Hawley"
I donated in support of this campaign on Sharon Linstedt's page. I donated in support of this campaign on Sarah Augustynek's page. We are asking our friends and allies to rally their friends, family, and networks to support our 12th Annual Walk a Mile in Her Shoes® campaign! Show your support for ending sexual and domestic violence by becoming a fundraiser for Crisis Services' Advocate Program. Get your friends and co-workers to donate to your fundraiser and/or join you for an afternoon of fun and awareness raising. Watching and/or walking in high heels is entertaining and, more importantly, a good way to bring attention to a very important issue: sexual violence. Starting a fundraiser is easy to do, and it's fun. We'll even give you all the tools you'll need to make a difference. With your help we can create a movement where men and women will be a part of the solution to ending sexual violence. JUST ANNOUNCED!!! 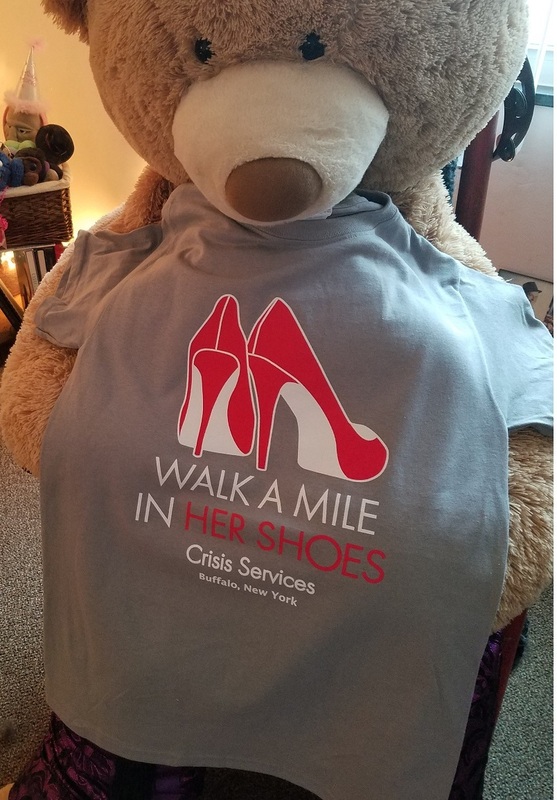 We will be giving a Walk A Mile In Her Shoes T-shirt to everyone who raises a minimum of $100! !